It has been more than a year and a half since the last primetime series of Enrique Gil and Liza Soberano. However, their fans are not going to wait any longer as the Kapamilya Loveteam is going to be seen in the upcoming fanteserye entitled “Bagani”. 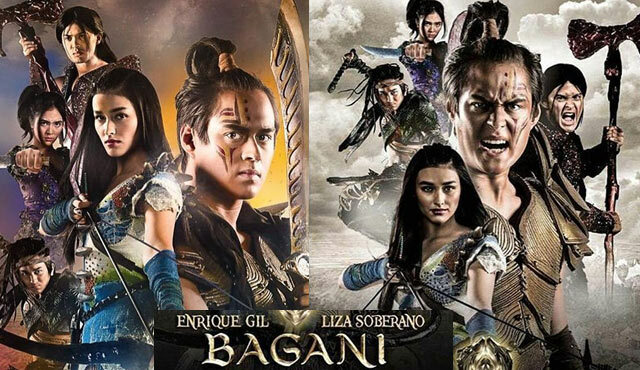 The first trailer was revealed last February 8 where Enrique will play as “Lakas” while Liza will portray as “Ganda” who are 2 warriors from different clans. Lakas is living on the desert with his parents Agos (Albert Martinez) and Lila (Ana Abad Santos). However, his fate has changed when his father got killed and became allies with Christian Vasquez’s character. He will then pretend to be a friend with Ganda who was from the land of farmers for the sake of his mother. Other stars will also include Matteo Guidicelli, Makisig Morales, Sofia Andres, Diether Ocampo, Ryan Eigenman, Precious Lara Quigaman, Maricar Reyes and many more. This will be Liza and Enrique’s follow-up project after their hit movie “My Ex and Why’s” and their 3rd teleserye after “Forevermore” and “Dolce Amore”. Bagani is under Star Creatives directed by Lester Pimentel and Richard Arellano. It is also expected to replace ‘La Luna Sangre” after its conclusion in 3 weeks. ABS-CBN has unveiled its upcoming teleserye of LizQuen where fans and casual viewers alike are excited for the comeback of the popular tandem. The latest fantasy and adventure series is going to premiere on March 5 and will be watched worldwide through The Filipino Channel (TFC). Most Hyped TV Series of ABS-CBN in 2018 – when it was announced last year, there were some controversies when it was tagged as a copycat to GMA’s “Encantadia”. However, when the trailer was revealed, it is safe to say that the story is far different compared to what the writer and bashers think. Big Production – it is evident that the network spent a huge budget to pull off pre- Spanish era Philippine setting and detailed costumes. Diether and Makisig’s Comeback – we will be happy to see Diether’s return to his mother network after his last project in MMK and Makisig who was last seen in “Mirabella” last 2014. LizQuen’s Return – as one of the most popular love teams in the country, this will be their 1st fantaserye and action series for the 2. ABS-CBN’s Biggest Teleserye - it is expected to be the network’s biggest series this year from its powerhouse cast, epic storyline and great cinematography.